Central Utah Water Conservancy District » Roll out the pumpkins! Monica Hoyt can’t wait to astound audiences again at this year’s Pumpkin Walk, which is being held from 12 to 6pm on Oct. 28 at the Central Utah Gardens. The distinguished scientist at the Central Utah Water Conservancy District (also its public outreach coordinator) faces some tough competition. A magician will be there with more than a few tricks up his sleeve. Guest artists will conjure up caricatures from 1 to 5pm. Candy, prizes, and fun activities lurk at every turn, beginning with a free donut for everyone who shows up in costume. Throughout the grounds, already dressed in fall colors by Mother Nature, are the carved, painted and decorated pumpkins submitted the day before for the Pumpkin Carving Contest! The best part? It’s all free. Even, bwaahahahahahaha, Monica Hoyt’s puking pumpkins! Of course, the district hopes young and old will leave the grounds knowing a little more about water conservation. There’s even a lesson buried in foamy white pumpkin “puke” that promises to draw standing-room-only crowds every hour on the half hour through 4:30pm. This is, after all, the single largest public event on the district’s calendar and for good reason. Here, we offer a few tips to get the most out of the experience. Make this year the year you enter a jack-o-lantern in the Pumpkin Carving Contest! One entry per person is allowed, though you can use more than one pumpkin in your entry (such as a pumpkin family). Prizes for the 12-and-older crowd are $350 for the most detailed, creative, and humorous in the carved and painted/decorated categories, $100 for multiple garden staff choices and the people’s choice award chosen during the Pumpkin Walk. Drop your entry off between noon and 6pm Oct. 27 at 355 W. University Parkway in Orem and pick them up between 6 and 7pm Oct. 28 or 8am and 6pm Oct. 30. Click here for more details. The junior contest, open to pumpkin carvers 11 and younger, will award a movie package to first place, a pizza dinner to second, and a dozen glazed donuts to third. Again, drop off entries – one per person – between noon and 6pm Oct. 27 at 355 W. University Parkway in Orem. Check out the competition! Here are past prize winners in the 12-and-older and junior contests. And all of this year’s entries will be on display at the Pumpkin Walk on Oct. 28. 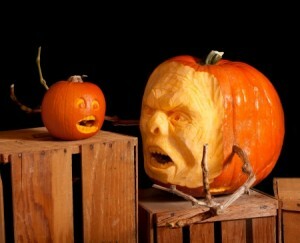 As for what to expect at the Pumpkin Walk, seeing is believing! Click here for a virtual sneak peek at the good times ahead. And all of us at the Central Utah Water Conservancy District wish you and your families a very happy Halloween!